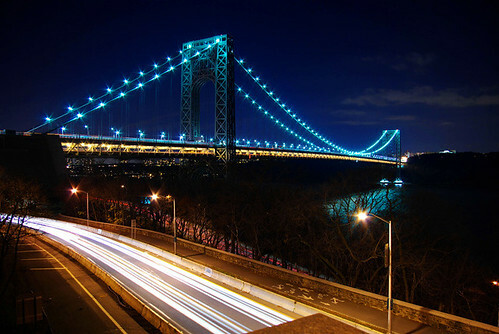 The Port Authority of New York and New Jersey has completed the installation of LED fixtures on the necklace of the George Washington Bridge. The 156 light emitting diode fixtures replace the span’s mercury vapor lamps and are expected to save $49,000 in energy and maintenance costs annually. The LED fixtures have 80,000-hour, or 15-year, life spans, while the mercury lamps only lasted one year on average. The Port Authority also expects the new energy-efficient fixtures to reduce carbon dioxide emissions by 220,000 pounds per year. The capital project was approved by the authority’s board of commissioners in 2007 as part of an initiative to reduce green house gas emissions at Port Authority facilities.